In 1969, J. David Bamberger bought what he described as “the sorriest piece of land” in the Texas Hill Country for the specific purpose of restoring the degraded landscape. Today, Selah, Bamberger Ranch Preserve is one of the largest habitat restoration projects in the state—5,500 acres—and serves as a model for land conservation and environmental education. The ranch has earned numerous awards, including the coveted Leopold Conservation Award, the Texas Environmental Excellence Award in Education, the National Private Lands Fish and Wildlife Stewardship Award, and most recently, the Botanical Research Institute of Texas International Award of Excellence in Conservation, just to name a few. 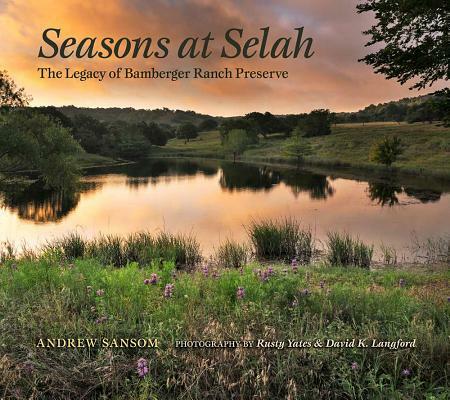 Seasons at Selah: The Legacy of Bamberger Ranch Preserve chronicles Bamberger’s dedication to ethical land stewardship and conservation education through stunning photographs of the land, plants, and wildlife he has devoted his time and resources to protect. Photographers Rusty Yates and David K. Langford capture each season at Selah and offer an intimate glimpse into the day-to-day management and operations of the ranch as well as some of the challenges it faces. In the accompanying text, Andrew Sansom shares his own stories from his decades-long friendship with Bamberger. Readers will gain a deeper appreciation for what conservation means for Texas: clean and abundant water, wildlife, healthy land, and an inspiring place to learn about and enjoy nature. Above all, Selah has given Texans a special opportunity to stop, pause, and reflect on the importance of good stewardship of the earth. ANDREW SANSOM is executive director of The Meadows Center for Water and the Environment at Texas State University. The author of numerous books, including Of Texas Rivers and Texas Art, he previously served as the executive director of The Nature Conservancy of Texas and the Texas Parks and Wildlife Department. He resides in Austin, Texas. RUSTY YATES is a former featured photographer in Texas Highways and Texas Parks and Wildlife Magazine. His work is held in private collections throughout the United States and has appeared in numerous publications, exhibits, and galleries. He lives in Johnson City, Texas. DAVID K. LANGFORD owns and operates Western Photography Company. He is the author of Fog at Hillingdon and coauthor of Hillingdon Ranch: Four Seasons, Six Generations. He lives on his family ranch near Comfort, Texas.